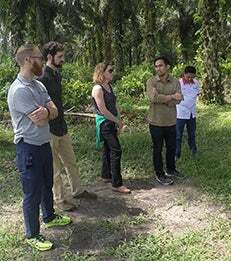 Through a new Stern Signature Project, a team of four MBAs worked with Golden-Agri Resources on an innovative financing program to address the sustainability, scalability and environmental impact of palm oil production. Smallholder farming is a tremendous opportunity for local communities to join the global economy and lift their families out of poverty, but, at the same time, there are significant social and environmental issues that are entangled in the palm oil business. From lipstick to laundry detergent, complex biofuels to common foods, palm oil is one of the most widely used products in consumer goods around the world. With the majority of the global supply produced in Indonesia and Malaysia, concerns over sustainability, scalability and environmental impact are rapidly growing among governments, financiers, producers and consumers alike. Partnering with the NYU Stern Center for Sustainable Business and Golden Agri-Resources (GAR), one of the world’s largest palm oil suppliers, a team of MBA students – Max Krasilovsky, Eliot Marcus, Nancy Van Way and Charles Walker – set out to better understand the complex issues inherent in this global agribusiness and propose new ways to help maintain production needs, preserve the livelihood of local farming communities and protect the environment through a Stern Signature Project focused on sustainable finance. The team started with a benchmarking study, looking at ways non-governmental organizations (NGOs), governments and industries have approached these issues in the past as well as what other financial players have done to facilitate feasible loans for smallholder farmers. They then traveled to GAR’s headquarters in Singapore and plantation in Sumatra to learn more about supply chain operations, witness the laborious process of seed plantation and harvesting and discuss different perspectives on the project with representatives from the Indonesian government, the banking sector, NGOs, international donors and smallholder farmers. Armed with their extensive research, the students developed an investor presentation to help pitch GAR’s pilot innovative financing program to potential funding sources and proposed new programmatic elements to help increase the program’s scale, involve more stakeholders and better embed sustainability. “We’re thinking about ways to expand this and similar programs in the future by involving more players and creating partnerships – a variety of ways to institute new practices to continue working toward a more comprehensive solution,” Max explained. For the students, the project presented an opportunity to merge their professional backgrounds and interests in sustainable agriculture – ranging from supply chain operations to impact investing – with their in-class learning on a project focused on immediate, real-world impact for their clients, the farmers and the environment.